Imagine - ripping your torso as you hit a curve launching your sprint kart down the circuit. Pressing on the accelerator as you exercise dead-on hand-and-eye coordination determining the smartest way to turn the drift in the 21st minute of an hour-long enduro race. Or perhaps be a spectator - routing for the likes of Fernando Alonso and Michael Schumacher as they race neck-and-neck on the last lap. Guess what - you are breathing and witnessing (even smelling the distinctive aroma of clay dirt on the dirt track) the atmosphere that comes with go-kart racing. Developed in the 1950´s by pilots with a zest for tinkering with motorcycle engines to propel simple frames, go-karting extended internationally after the construction of the first go-kart by Art Ingels in Pasadena. Before dwelling on it's mass European appeal and discussing the pinnacle of Formula 1 racing, let's backtrack for a second. Riding go-karts (or karting) is the best way to break into professional racing. It is the simplest means of exploding your chassis down the track before getting into the sophisticated arena of professional racing. Single cylinder engines, basic chassis models, and lack of speed producing components provide go-kart racing with the air of simplicity, geared towards beginners and novices. The concept of sprint karting comes to our mind when we think of the prototypical kart & track in amusement parks, recreational areas, and arcade palaces. Impeccable karts with sleek designs and sturdy frames rip through on short tracks, usually made from asphalt or concrete - ranging from half a mile to a mile in length. Sprint karting is divided into classes (think boxing middleweights and welterweights) that distinguish engine-types (two-and four-cycle), driver (classified according to age and weight), brand of kart (Yamaha and Honda are popular choices), and specifications. No carbon-fiber made frames and McLarens built with lightweight materials here! Sprint karting is a simplified, scaled-down form of professional go-kart racing with shorter tracks, downgraded technology, less experienced drivers, and downgraded components across the board. Other forms of karting include enduro racing. Endurance racing, or "enduro" for short is a prolonged version of sprint. Propelled by aerodynamical butterfly steering, enduro karts are an upgrade over sprint karts - participating in races lasting an hour or more. Dirt, oval tracks is the staple of endurance racing and is more prevalent in the Midwest than anywhere else. Because of the long racing period, special emphasis is paid to durable karts and pit stop maintenance than focusing on just speed. In runner's terms, enduro is a marathon - not a sprint. If you sacrifice chassis and tire maintenance for speed throughout the course of a race, reaching the finish line is out of the question. Behind every successful sprint car are its well-performing components, specifically its frame, engine, and tires. The dynamics of a go-kart is two-fold: to be built to withstand the rigors of racing and to serve as the backbone for speed. Usually made of steel, frames have the option of being flexible or not. 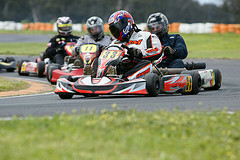 Flexible frames mean easier maneuvering along the track, especially when turning as to maintain good "side bite" and control of the kart. Because non-professional go-karts have no sophisticated traction and suspension system to withstand bumps, frames are usually subject to more punishment. Sprint kart tires usually do not have indented grooves, as they are soft in nature and more suited to all-terrain. 900 BHP horsepower engines are the norm for souped-up Honda Formula One karts. Capable of reaching speeds of 200+ mph, they represent the all-out nature of karting technology. For the novices, a simple 2-cycle engine will do! Running on gasoline and electricity instead of petrol (typically mixed with other fuels to suit environmental conditions for Formula One,) sprint karts run on either 2-cycle or 4-cycle engines. 4-cycle engines are the weakest engine around, with horsepower topping 20 HP. Think of the power needed to run a heavy-duty vacuum cleaner - that's how much power a 4-cycle engine exerts. 2-cycle engines are typically associated with the likes of Vespas (European motor scooters) and mopeds. These go up to 90 HP. Added cylinders (individual horsepower generators in go-karts) can boost horsepower, adding pure speed & power to your machine. Perhaps 10-cylinder Formula One kart engines and its incredible capabilities ring bells to you now! Want pinpoint control over the speed of your go-kart? No problem here! Go-karts have basic transmission systems with gears that control speed to its desired amount. Coming with clutches, shifter karts (a popular type of sprint kart that allows you to move at a certain amount of speeds) make the best use of engine power when zipping along a straight path or maneuvering over the short or wide curve. Depending on the amount of cylinders and engine, shifter enthusiasts can lay opponents in their dust blazing trails up to 90 mph. Shifters usually run on larger road courses known as road racing. It is flush in structure with qualification criteria like class of kart, weight of driver, etc. Honda, Kawasaki, and Yamaha are popular suppliers of engines. These companies are at the forefront of karting technology, regularly tinkering with what's already available or creating new concepts of their own. Sprint karting opportunities are available to everyone. If you want to enjoy it as a form of recreation instead of competition, visit your local track and rent a kart! Make sure to sign any insurance waivers and become acquainted with the rules and regulations! If you like to compete, inquire from within. Sprint karting is one of the least expensive sports out there. People from all walks of life and all economic backgrounds can drive a kart, or even purchase their own with a powerful engine. 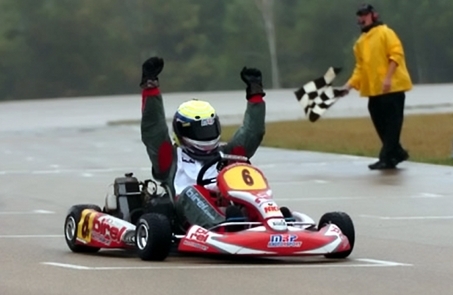 There are many karting schools available all over the nation that will let you ride their karts for a nominal fee. In essence, karting is more than a pastime. It is a bonafide sport capable of preparing you for more advanced karting by helping you shape your judgment, hand-eye coordination abilities, and technological/dynamical know-how of the instruments you're using.